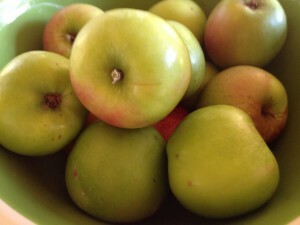 My friend gave me a bag full of her beautiful apples right off her tree. It doesn’t get any better than that. Except a week later she gave me another bag and I can’t believe these are even bigger and juicier. The first bag I made this super easy apple crisp. Crisps are so easy and with so few ingredients I just made it up as I went along. I went to a friends’ and shared with lots of moms and kids. It was a hit and I was asked for the recipe. Oops! My own kids didn’t have any crisp. And my daughter didn’t get to help. 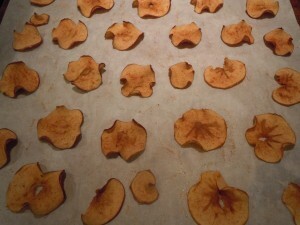 So when the second bag of apples came around my daughter and I made another crisp to share with my kids and followed a real recipe so I could share with everyone. 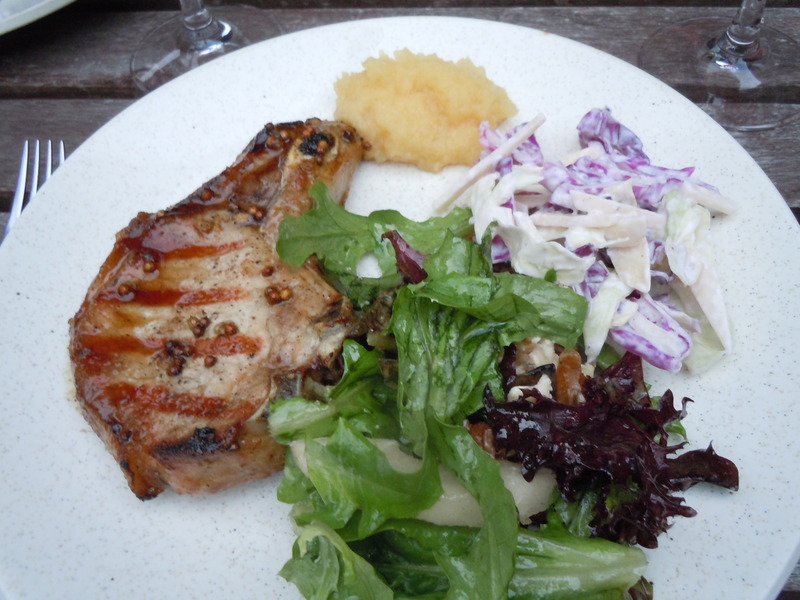 Although I cooked according to directions for 40 minutes and the apples turned to sauce. 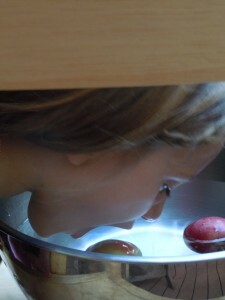 I think 25 – 30 minutes for firmer apples. 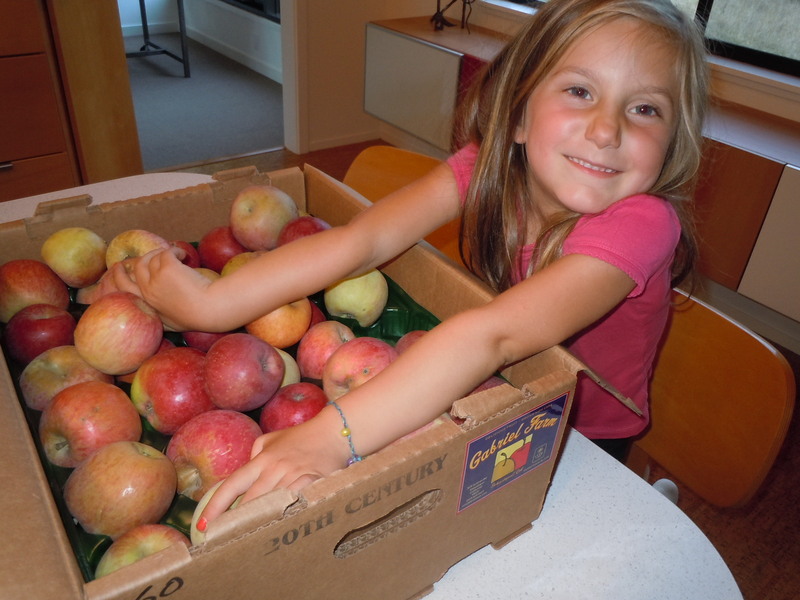 Another great option for fall apples is an Apple Gallett. Easier than a pie as the crust is tasty but more rustic and doesn’t require all the fuss of a pie pan, fluting, etc. 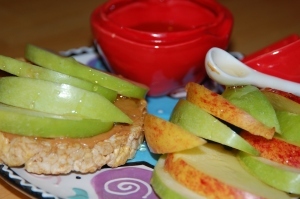 I still have some apples left so I’ll make this next. Cut together flour, brown sugar, and butter until crumbly; sprinkle evenly over apples. Bake at 350° for 30-40 minutes until apples are tender; serve warm with vanilla ice cream. Meanwhile, spread walnuts in a baking pan and bake in a 375° oven until barely golden under skins, 6 to 8 minutes (leave oven on). Coarsely chop nuts. Peel and core apples; cut each into eight wedges. In a 10- to 12-inch nonstick frying pan over medium heat, melt remaining 2 tablespoons butter. 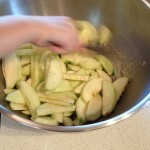 When it’s foamy, add apples and stir often until slightly softened and brown at edges, 10 to 12 minutes. Sprinkle brown sugar and nutmeg over fruit and stir until liquid is syrupy and bubbling, about 5 minutes. Stir in walnuts. Remove from heat. 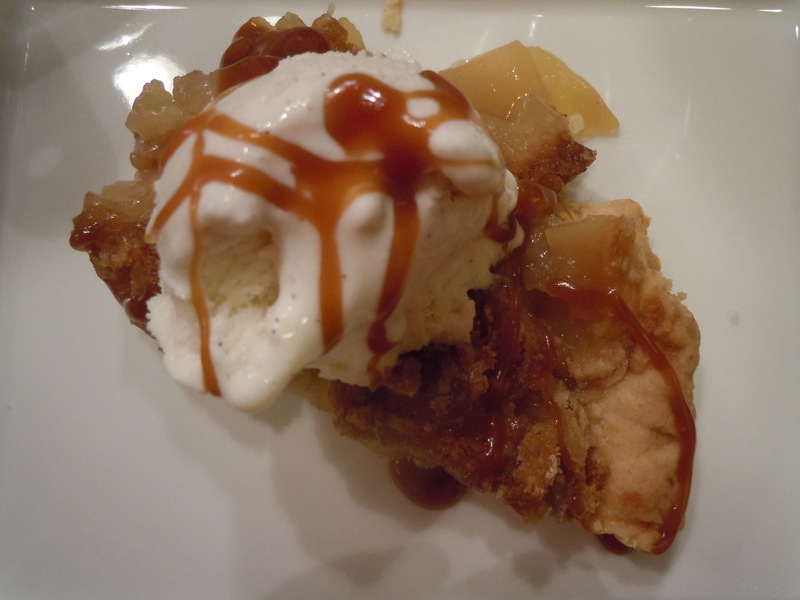 Pour apple mixture onto center of pastry, mounding wedges in a circle about 8 inches wide and 2 inches high. 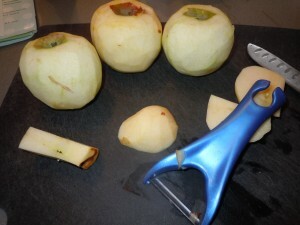 Gently fold edges of dough over apples, pleating as you go, leaving an opening about 4 inches wide in the center. Brush pastry all over with beaten egg. Bake in 375° oven until pastry is golden brown and apples are tender when pierced, 40 to 45 minutes (35 to 40 in a convection oven). Transfer galette (with parchment, if using) to a wire rack to cool. Transfer to a large plate, gently pulling parchment from under tart. 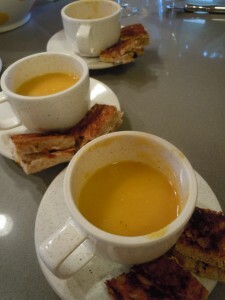 Serve slightly warm or at room temperature, cut into wedges. Jewish New Year, Rosh Hashanah is here. 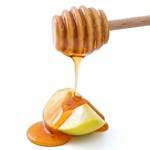 It is a tradition in the Jewish culture to dip apples in honey for a sweet New Year. 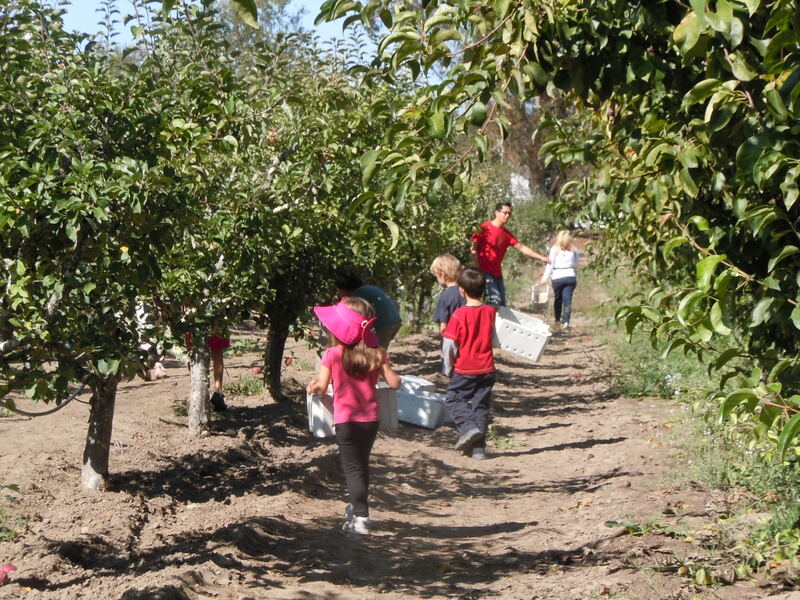 It doesn’t matter what time of year or what your culture, apples are the most popular fruit in the world. And really who needs an excuse to dip them in honey? Yum! 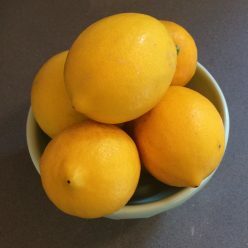 Here’s a link to my friend Lisa’s Velick’s blog who writes about all things gluten free and always gives me a lesson on the Jewish holidays and celebrations. Today was cold and rainy here in Northern California. I have to keep reminding myself it’s mid-May, as we put on rainboots and remember umbrellas to head out for the day. We would usually be making fresh lemonade by now. But today when my kids got home from school they asked for steamed milk. I thought it was a great idea as I needed to warm up too. Everyone likes the warmth and comfort of a warm drink on a cold day. Having a frother on hand is great for making quick foam from any kind of hot milk. When making steamed milk for my latte one day I discovered my son really enjoyed the foam on the top. I poured him a glass of the warm milk and he loved it. I laughed at his cute milk foam mustache. Heat milk in a small saucepan over medium-low heat until just under boiling, 5 to 6 minutes. Pour milk into a frother and froth until foam becomes thick but it can still be poured. 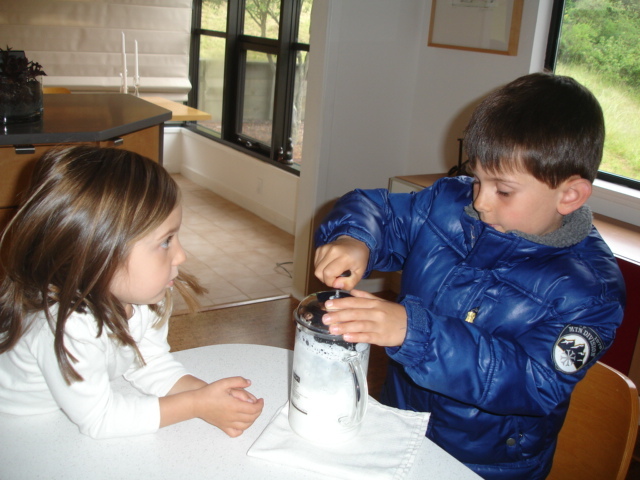 Serve steamed milk with a shaker each of cinnamon and chocolate and let kids top their lattes with something special like the grown-ups. These mini muffins have all the flavor of a big muffin, but fit nicely into little hands. Of course you can also make these in a regular full size muffin pan, just remember to increase baking time to 15 to 18 minutes and check for doneness. Be sure you’ve already introduced wheat and eggs before giving these muffins to baby. Preheat oven to 375F. Grease 24 mini muffin cups or 12 regular muffin cups. 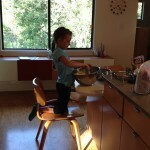 With a fork, combine flour, bran, salt, and soda in a small mixing bowl. Melt butter in a small saucepan over low heat or in a microwave for 25 seconds on High. In a large bowl combine butter, applesauce, one mashed banana, sugar and eggs. Mix together with a rubber spatula. Add flour mixture to applesauce mixture and stir until just blended. Batter will be lumpy and very moist. 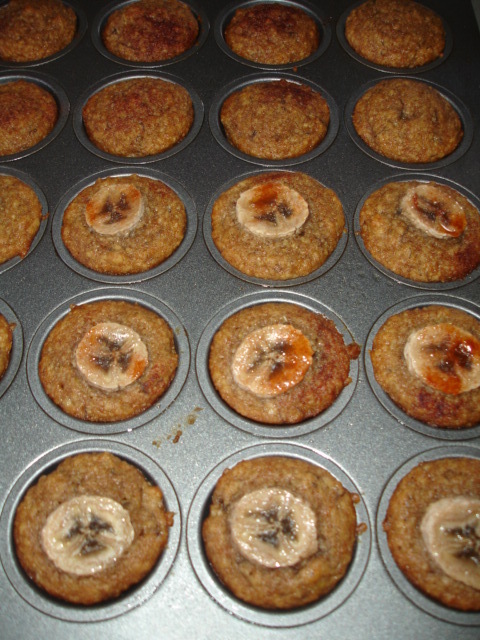 Spoon batter into prepared muffin cups, filling two-thirds full. 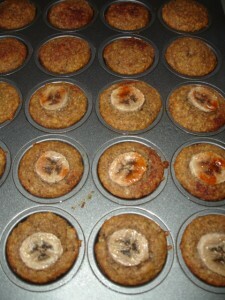 Place banana slice on top of each muffin. Bake for 12 minutes, or until golden brown and set. Cool muffins in pan on a wire rack for 5 minutes before turning out muffins. So we’re headed to the East Coast to visit family (and see a Red Sox game). It will be great once we get there. However anyone ever traveling with (or unluckily, near) small children knows how touchy and anxious the plane flight can be. Even if you’ve packed all the old favorite (and new) books, games, stickers, toys, DVD’s, etc. it may still not work for a child who is confined for more than an hour. 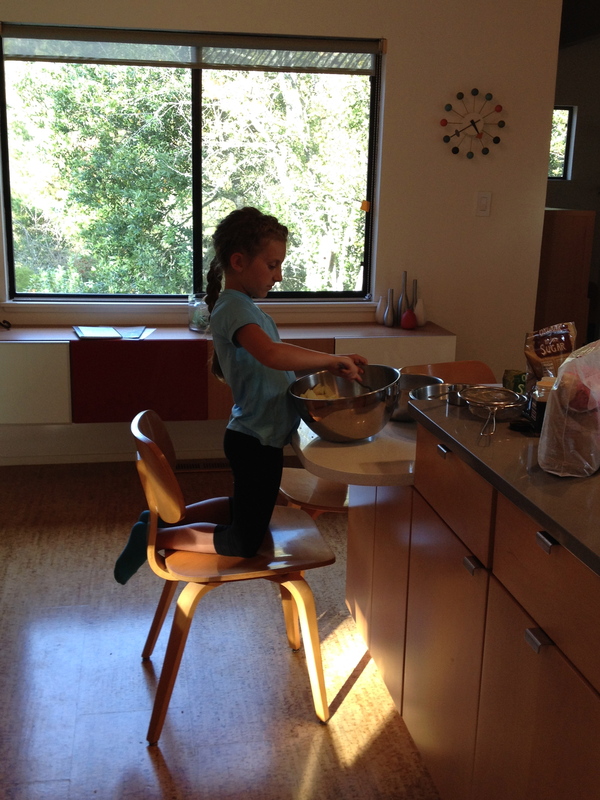 This is from my baking friend, fellow mom and food blogger Amy Andrews. It is the perfect crunchy snack for on-the-go packing or enjoyed at home in your child’s favorite cereal bowl with milk. It also makes the perfect top layer for a yogurt parfait. Line a cookie sheet pan with parchment paper. 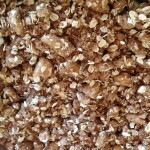 In large bowl combine the oats, almonds, coconut, and flax meal. In small bowl whisk together canola oil, agave nectar and maple syrup. Add the vanilla and salt. Pour over oat mixture and stir with wooden spoon to combine. 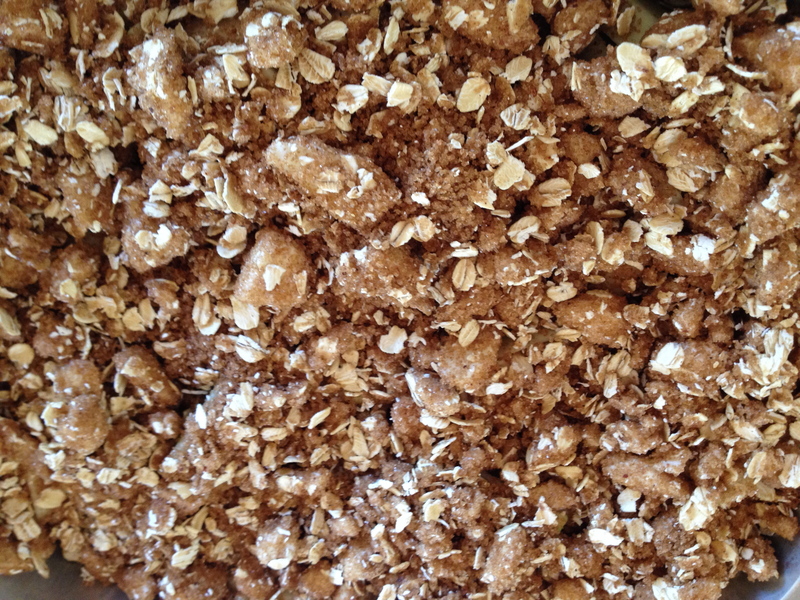 Pour the granola mixture onto the prepared cookie sheet pan and spread to an even layer. Bake for 1 hour stirring every 20 minutes until golden in color. Remove cookie sheet pan from oven and add the dried cherries. Stir to combine and let cool. 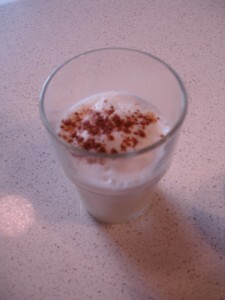 (At home, enjoy as a topping to organic yogurt or as a cereal with your favorite milk or nut milk.) Store airtight. An alternative to boring potato chips, this simple treat satisfies a child’s need for crunch. Having a mandolin provides convenience and accurate cuts for even baking. However a careful, steady knife works as well. 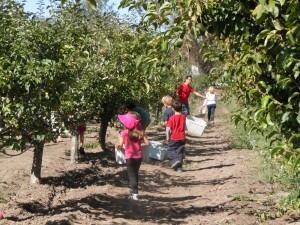 The apples crisp because of the low heat which dries out the moisture. Once in the oven these need no attention (just remember to turn off the oven overnight), until it’s time to pack them (or eat) them in the morning. 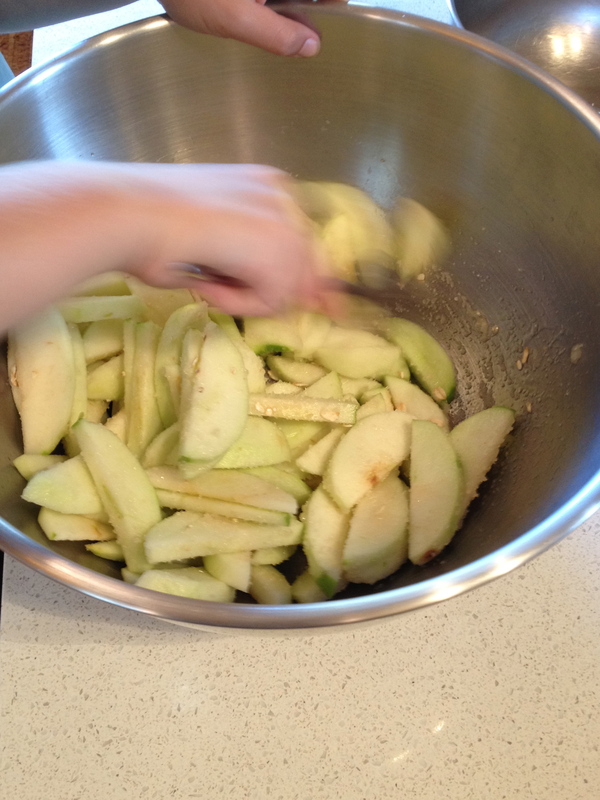 Makes about 48 apple crisps.